For the first time since returning to Earth, the most recent International Space Station inhabitants were welcomed at Star City near Moscow, where hundreds of people gathered on January 14 to greet them. 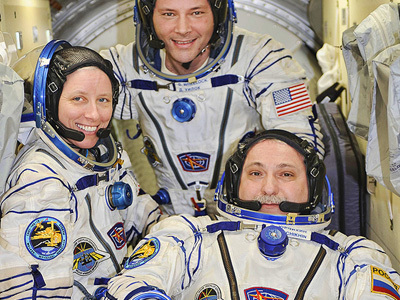 ­The crew of three successfully returned from orbit last November. 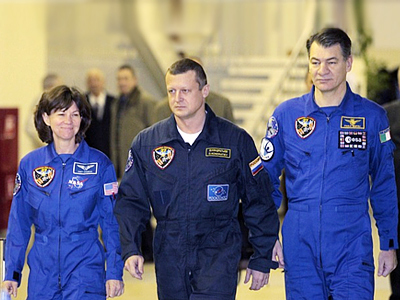 Russian cosmonaut Fyodor Yurchikhin spent a year in space, and his colleagues from NASA, Shannon Walker and Douglas H. Wheelock had about six months each. “Six months in space passed like one day. But there were lots of challenging and interesting tasks during that time,” Fyodor Yurchikhin said. According to Yurchikhin the crew of the Soyuz TMA-19 faced some problems in docking with the ISS – they had to repair the Russian module over the preceding one-and-a-half hours. The work to repair it was really tough, the cosmonauts said. Some equipment also broke during one of the spacewalks. But the spacemen showed calmness and discipline, acting like true professionals. “We carried out lots of experiments and we’re satisfied with the work being done,” Yurchikhin said. He also thanked his colleagues for the time they spent working, saying that the doors of his house are always open for them. The mission lasted 163 days and they managed to do a number of space walks and conduct 120 scientific experiments, including biotechnology, physics and chemistry tests.